Enter Yomiko Readman, a total bookworm whose room is littered with thousands of books in multiple languages. After buying a rare book for a ridiculous sum of money, she is attacked by a swarm of insects summoned by a man who has an interest in the book she is reading and steals it from her. It turns out that he is part of a terrorist organisation called I-Jin as well, the same people who attacked the Library of Congress and stole all of their books and manuscripts. Together, they go on their mission and find out that the stolen book is more important than they think. 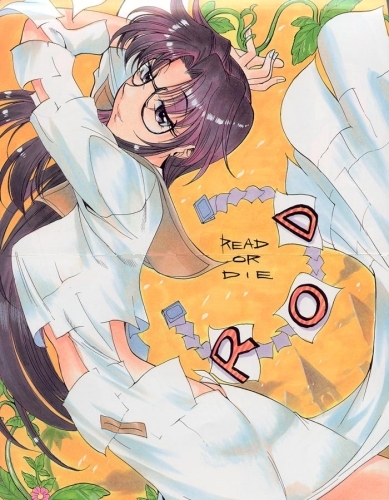 Read or Die [ROD] is a fun anime, no way can you take it seriously. ROD takes people from History and put them against the British Library's finest! Yomiko Readman [the paper] loves books and she just happens to buy a book which if it falls in to the wrong hands could well destroy the world as we know it. The Paper is joined by Nancy [Ms Deep] who apart from admitting to having a name like a pornstar has a costume to match. Ms Deep's skill is she can pass through solid objects. Each of the three episodes ends in a big battle with one of history's greatest. Episode one has a great paper battle and I really got in to the whole crazyness of the anime. Anything else that I type may well begin to ruin the story for you, so just buy the dvd, sit back, relax and enjoy one of the most enjoyable animes to date. A ROD tv series has also been completed and hopefully it will be just as enjoyable as this anime. Information on the historic characters that feature in the anime.